This No-Bake Layered NILLA Wafer Cake, isn’t a cake by traditional standards. 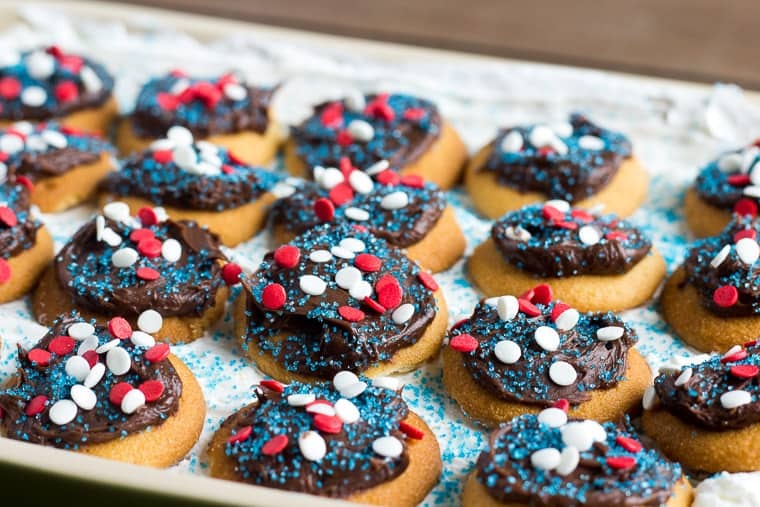 Make it by layering NILLA Wafers, pudding, and whipped topping, then top it with chocolate frosting! It’s a perfect dessert recipe for summer! You may seen, or enjoyed, a NILLA Wafer banana pudding recipe before, but this recipe doesn’t use banana at all! It’s made with just the vanilla pudding and whipped cream. The top layer of NILLA Wafers is covered in chocolate icing, which is literally the icing on the cake! Be sure to check out the video at the bottom of the recipe card to see just how easy this recipe really is! This past Easter, at our annual family egg hunt and dinner, my younger cousin reminding me of this layered dessert I used to make when I’d come over in the summer. It was a dessert, very similar to this one, but made with graham crackers. It’s one of those treats that everyone who’s ever tried it has loved and it’s perfect for family get-togethers! He told me after I made it for his family, he and his mom used to make it regularly. I actually learned how to make that dessert many, many years ago in an after-school cooking class (even though there’s actually no cooking involved). It had been so long since I had made it, but after talking with my cousin, I really wanted to share it with my oldest son and all of you! I made a few modifications, but it’s still just as easy and even more delicious than the original! Rather than using graham crackers, I picked up a box of NILLA Wafers at Walmart to use for the layers. The possibilities are endless with NILLA Wafers! 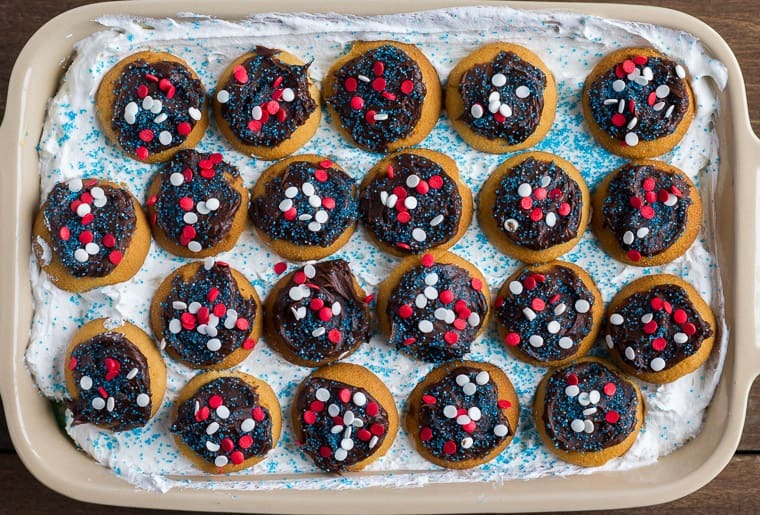 They can be used in all kinds of no-bake desserts, which are perfect for summer and especially July 4th (Independence Day)! You can find even more NILLA Wafer dessert recipes here! As much as I love cooking and baking, come summer, I much prefer to keep the oven off and the house as cool as possible. 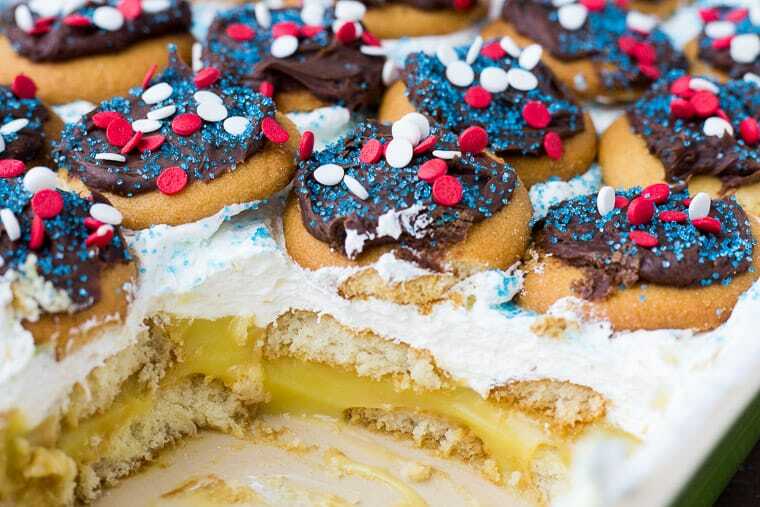 This No-Bake Layered NILLA Wafer Cake is a great option to serve or bring to your next summer party! I decorated this one in patriotic colors for The 4th of July, but you can add whatever colors and decorations you want, if you are celebrating another occasion. Well, first you need to stop by Walmart to pick up some NILLA Wafers and the other necessary ingredients, of course! 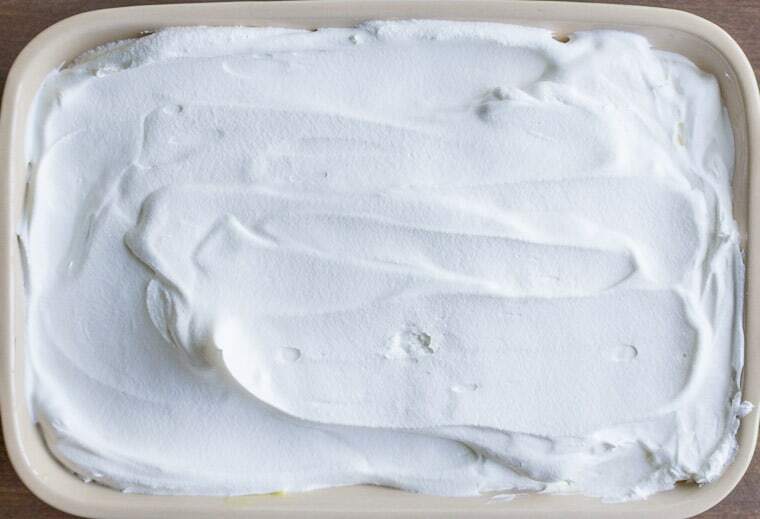 If you’re using frozen whipped topping, you’ll need to let that defrost before you begin. You will also need to make the instant pudding. 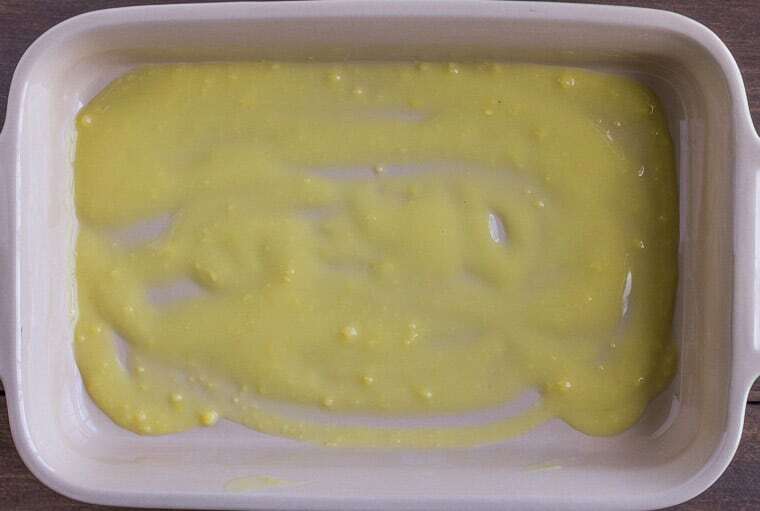 Add a spoonful or two of the pudding to the bottom of your baking dish (mine is 10.5-by-7-inches ) and spread it around. This kind of acts like “glue” to help keep the NILLA Wafers from moving as you add more toppings. Arrange a layer of NILLA Wafers to fit the bottom of the dish. You make have to break some in half to fill in all the space. Next, spread the vanilla pudding evenly over the NILLA Wafer Layer. Top with another layer of NILLA Wafers. Then, evenly spread 2 Cups of the whipped topping over that layer. 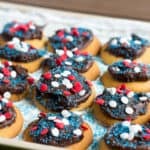 I cover the NILLA Wafers I use for the top layer with chocolate icing and decorations before putting them on the whipped topping. It’s much easier to do the icing beforehand. I did add a few more sprinkles afterwards too. Refrigerate for at least 2 hours to allow time for the NILLA Wafers to softened. Once the NILLA Wafers are softened, you should be able to cut through this cake easily with a spatula to serve. From May 15 to July 5, 2018 you can enter for a chance to win one of 7 Walmart gift cards! There is one $200 gift card grand prize and six $50 gift cards you could potentially win. I-C will randomly select winners from all program entries and will facilitate fulfillment of the winning prizes 7 winners. 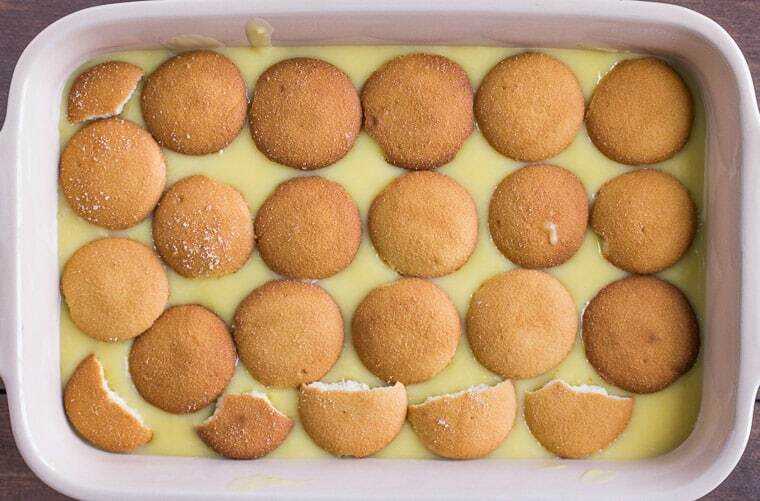 Love this No-Bake Layered NILLA Wafer Cake recipe? Follow us on Pinterest, Instagram, and Facebook for more! This No-Bake Layered NILLA Wafer Cake, isn't a cake by tradition standards. Make it by layering NILLA Wafer, pudding, and whipped cream, then top it with chocolate frosting! It's a perfect dessert recipe for summer! Add a spoonful or two of the pudding to the bottom of the baking dish and spread evenly. The dish I use is 10-1/2-by-7-inches. Cover the bottom of the dish with a layer of NILLA Wafers, breaking some in half, if necessary. 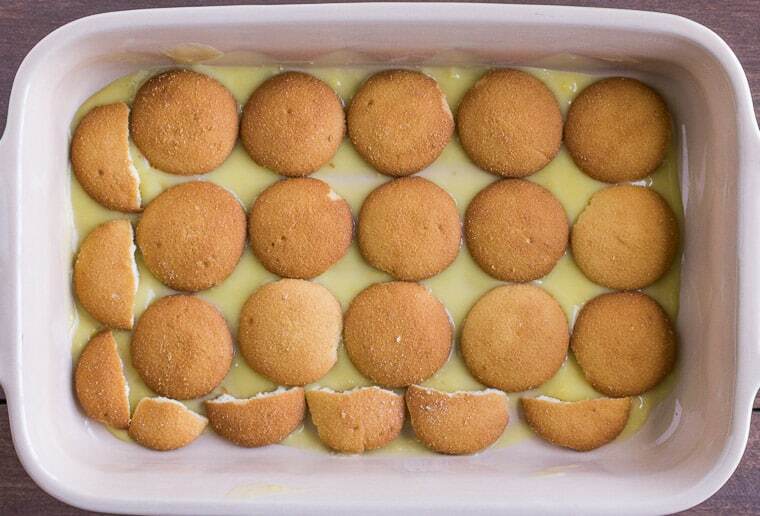 Cover the top of the NILLA Wafers evenly with the vanilla pudding, then add another layer of NILLA Wafers. Top that layer with the whipped topping. Ice the NILLA Wafer for the top layer with the chocolate icing and decorate before placing on top of the whipped cream. 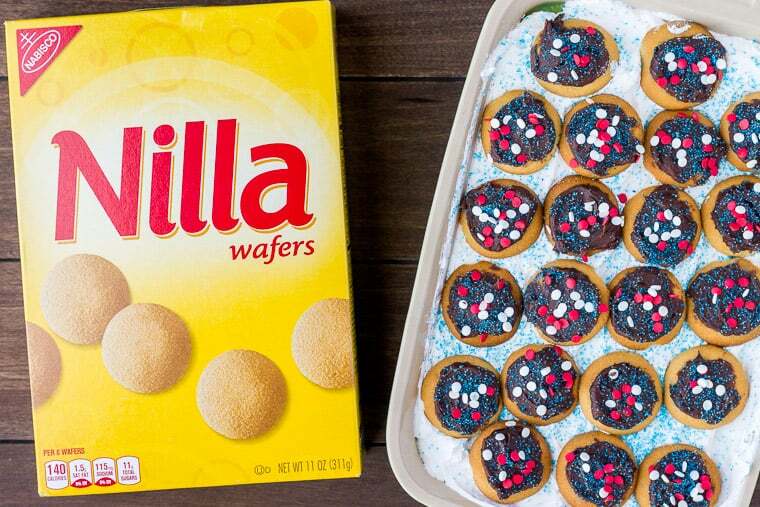 Refrigerate for at least 2 hours before serving to allow time for the NILLA Wafers to get soft. Mmmmm. Topping it with chocolate just makes this for me!!! Love it! I love ice box cakes! Making one with nilla wafers is genius!